This past weekend included a trip out to Crater Lake National Park. It was quite a drive, about 3 1/2 hours each way, but it was definitely worth it. For the most part, the weather was nice, and the view of the lake was amazing. The water was incredibly blue. 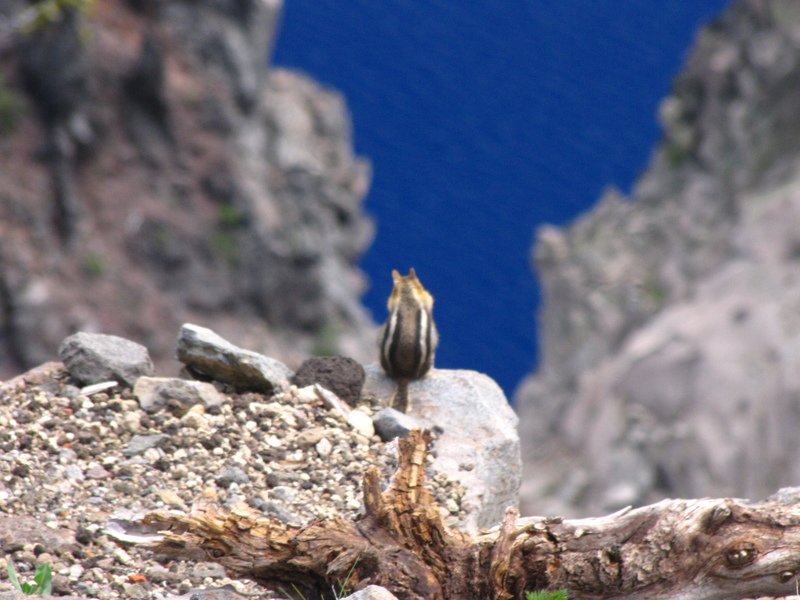 Even though the chipmunk in the picture is not entirely in focus, I really like the way this one turned out. I was able to frame it fairly well between the two rock faces. I tried again almost immediately after this shot, but the chipmunk ran away. The blue color of the lake also came out really nicely. This is another shot from two weekends ago. On Sunday, Leanne and I decided to drive out to the coast for the afternoon. For the most part, it was a very gray day at the beach, but we ended up getting about a 45 minute window of sun before the clouds came back. The West coast is so much different than the East. I’m used to just seeing miles and miles of relatively flat, sandy beaches back home. 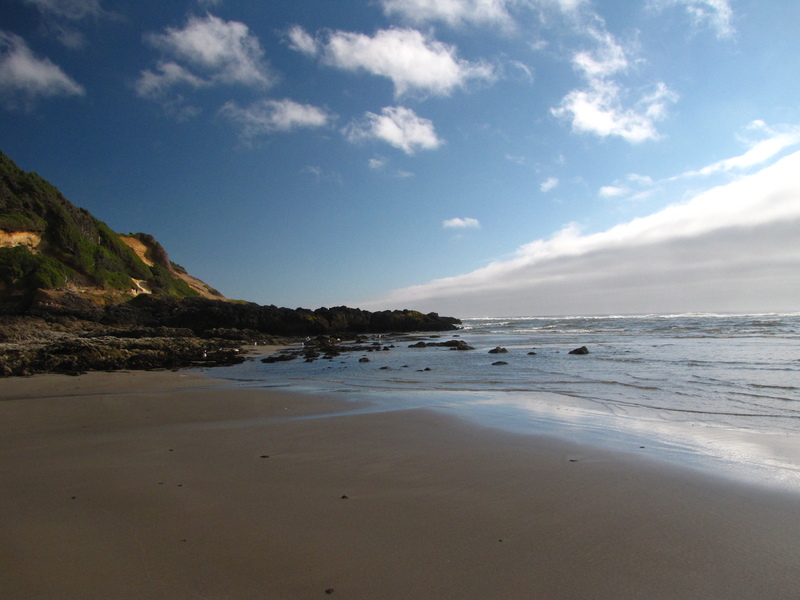 The landscape out here is a lot more interesting, and while the sandy sections of beach are somewhat few and far between, the rocky sections are really neat as well. There’s something pretty awe-inspiring about seeing the waves crashing against the rocks and shooting up a spray of water. I think the title is a pretty good description of how I’ve spent a lot of my time in the past few weeks. During the week, I spend my time working on my research project, which is really picking up steam at this point. Then on the weekends I go exploring in the Oregon wilderness. 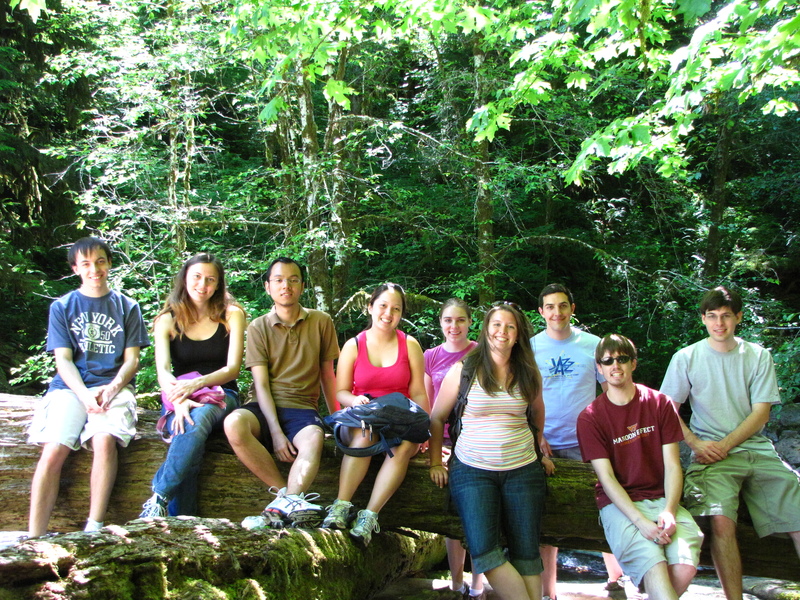 Two weekends ago, nine of us from the REU program took a drive out to Alsea Falls park, a little ways South and West of Corvallis. The drive there was a beautiful and twisty mountain road. 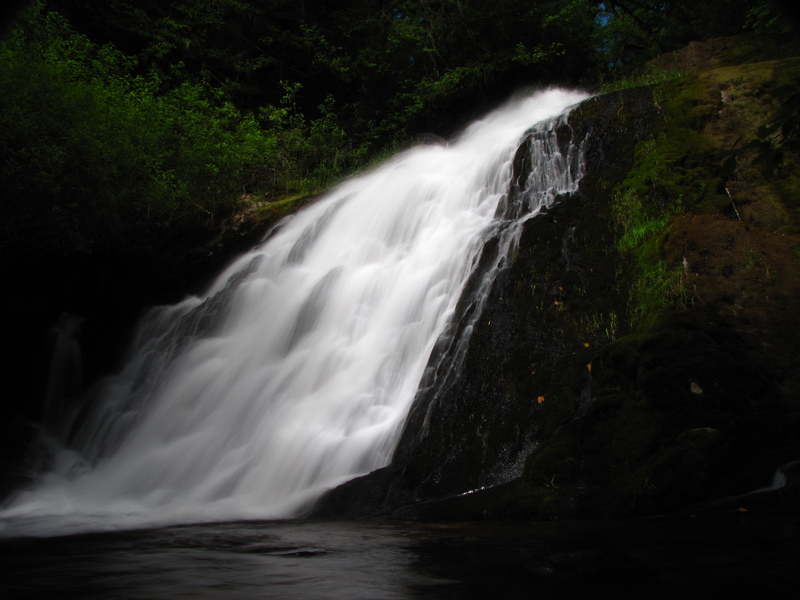 The picture above was of Green Peak Falls, at the end of a really nice hike through the woods. Luckily, I’m getting better and better at photographing waterfalls. With the help of my Gorillapod I was able to set my camera up out on the rocks in the middle of the stream. Since the sun was out, I put on both the polarizing and neutral density filters and turned the ISO down as far as I could. By doing all of this, I was able to slow the shutter speed down to eight-tenths of a second before things started to be blown out. The shot above was actually at three-tenths, but I liked the way it turned out better than some of the longer ones. I’ve had several more adventures since then, but I’ll save the stories and pictures for another post. I’m sorry about the large delay between pictures here, but there’s good reason for it. I think that before, I used to work on this blog and my old pictures when I was feeling kinda down. It was usually a way for me to go back through some good old memories. Looking back a little ways, I’ve also been using it as a place to get the things that are bothering me off my chest and somewhat anonymously complain about things that I wish had gone differently. Recently, however, I haven’t had a reason to do either of those things. For the first time in a while, I can say that I am happy. Not just content, but truly happy. I am having the time of my life this summer out in Oregon, and that means that I don’t have quite as much time for doing this blog. I’ll try to keep putting pictures up, but know that there might not be as much in the way of writing as usual. 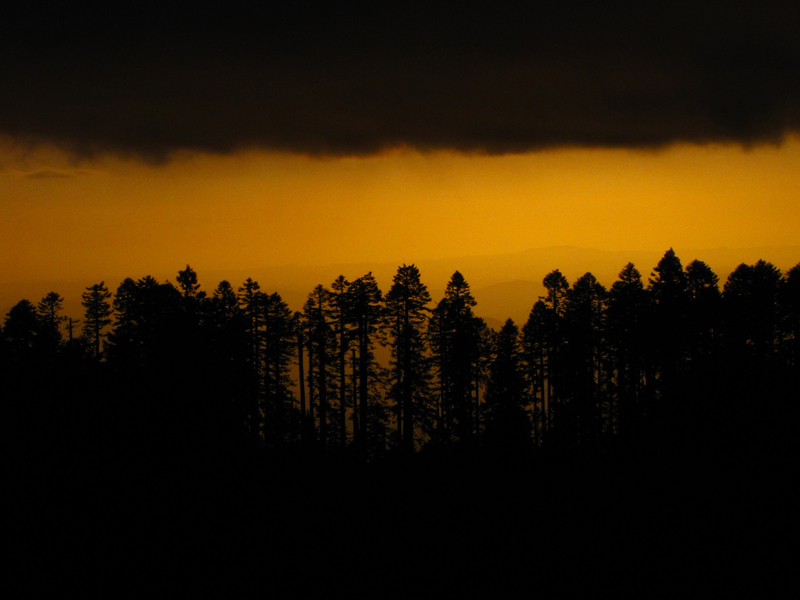 This picture comes from a trip I recently took to the summit of Mary’s Peak a little ways West of Corvallis. We tried to time it so that we made it to the top around the time the sun was going down. Unfortunately, however, the top of the mountain was shrouded in clouds when we got there, and you couldn’t really see the sun, or much of the surrounding countryside. It was a really cool experience though, it’s not often that you find yourself inside a cloud. After a quick picnic at the top, we decided to come back down to escape the surprisingly chilly winds. I took this picture from the path as we were getting close to the parking lot. I really loved the silhouette of the trees in the late evening light, and the fact that you could see through them at some points. Wanting to get as much of the orange coloring as I could, I bumped the exposure down to -2EV. It turned out really nicely, and I’m glad that I included a little bit of the cloud cover at the top of the picture. I didn’t notice the hills in the background when I originally took the shot, but I really like the misty, distant look. Sorry for the delay between posts here, a lot has been going on in the last week or so. First of all, the pace of the research is really picking up as we all kinda figure out just what it is that we’re doing. The long weekend of the 4th was great. I found a place down in Eugene to go salsa dancing that Friday night, and plan to go back this week. We went down to downtown Corvallis several times over the weekend, checking out the farmer’s market on Saturday and then live music and fireworks on Sunday.